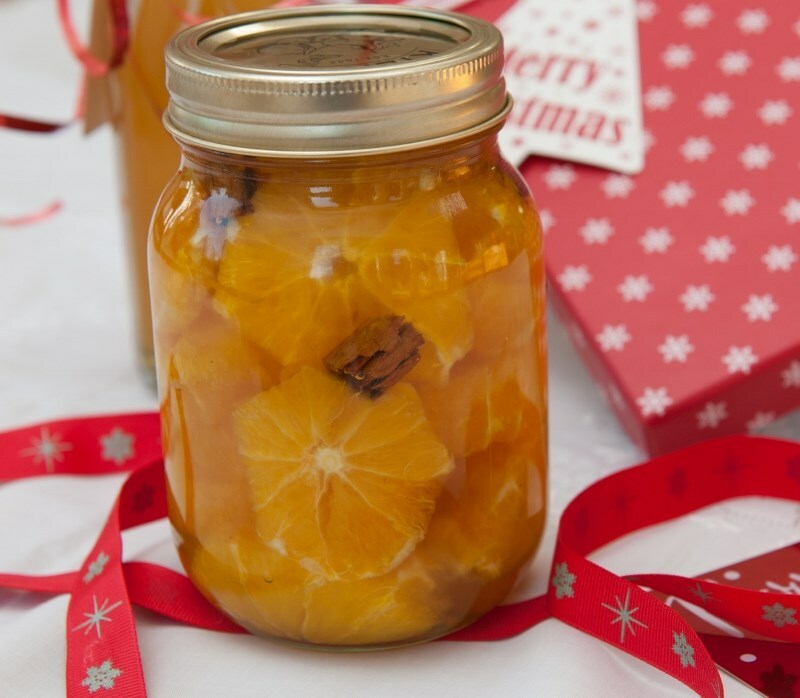 This is a quick and easy recipe bursting with Christmassy flavours. These oranges make a lovely gift. Once opened, they last six months provided they continue to be covered with the preserving liquid. Sterilise two 500ml screw top jars by washing them thoroughly and then placing them, and their lids, on a baking tray in a heated oven at 140˚C (120˚C fan/Gas 1) for 15-20 minutes. THE OVEN TO 110˚C/90˚C FAN/GAS ¼.
Wash the oranges and pat dry with kitchen paper. Peel the zest of two oranges, place in a sieve and plunge into boiling water 3 times. Set aside. Peel the rest of the oranges, removing every trace of pith. Slice the flesh and fill the sterilised jars with the orange slices. Place the jars on a baking tray and put in the oven for 30 minutes. Meanwhile put 150ml of water into a small pan and add the sugar and the cinnamon sticks. Bring to the boil and cook for 2 minutes. Remove from the heat and leave the syrup to cool. Add the orange zest and brandy to the syrup and stir well. Cut each cinnamon stick into 3-4 pieces with a sharp knife and return to the pan. Pour the syrupy liquid over the orange slices until they are completely covered. Seal the jars with their lids and leave in a cool, dry place for a month before eating.